Police officers guard the entrance to the detention center of the Bolivarian National Intelligence Service (SEBIN) in Caracas, Venezuela March 21, 2019. Venezuelan opposition leader and self-declared interim president Juan Guaido says intelligence agents have detained his chief of staff. Guaido's aide, Roberto Marrero, reportedly was taken into custody in an overnight raid on his home. "We do not know his whereabouts," Guaido wrote of Marrero in an early morning Twitter post. "He must be released immediately." FILE - Venezuelan opposition leader Juan Guaido, who many nations have recognized as the country's rightful interim ruler, speaks during a meeting with representatives of the oil sector in Caracas, Venezuela, Feb. 5, 2019. Also, opposition lawmaker Sergio Vergara's home was searched but he was not detained. Venezuelan President Nicolas Maduro and Guaido both claim to be the legitimate president of the South American country. 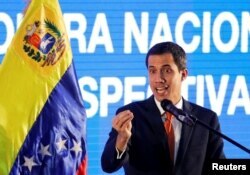 The United States has frequently warned Maduro's socialist government from arresting Guaido or his aides. Secretary of State Mike Pompeo quickly denounced the actions and demanded that Marrero be released. "We call for his immediate release," Pompeo said on Twitter. "We will hold accountable those involved." U.S. National Security Advisor John Bolton tweeted "Maduro has just made another big mistake" that "will not go unanswered." U.S. President Donald Trump reiterated Tuesday that "all options" are under consideration to oust Maduro from office, suggesting military action if necessary. Guaido declared himself interim president on January 23rd. He has the support of the U.S. and about 50 other countries, primarily in Latin America. Maduro is supported by Russia and Cuba, retains the allegiance of the military's leadership and maintains control of state apparatus. Venezuela's Information Ministry did not immediately comment on the overnight operation. The oil-rich country's economy has contracted sharply in recent years and inflation has exceeded 2 million percent. The dire economic conditions have fueled malnutrition and disease and triggered an exodus of more than 3 million citizens since 2015. Economic conditions are expected to worsen when the U.S., Venezuela's largest crude oil customer, imposes a ban on all oil sales to the U.S. on April 28. Maduro contends his government has been victimized by an "economic war" led by political opponents and blames previous U.S. financial and oil sanctions for the country's economic crisis.